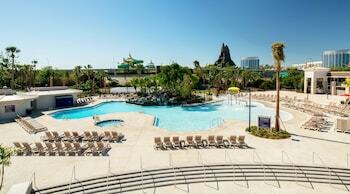 Orlando is a vacationers paradise, with everything being minutes from your hotel. With its big name theme parks, like The Walt Disney Resort and Hollywood Studios, you will spend days and still never see everything. The convenience of staying within Orlando and using public transportation between attractions will save you time and dollars. A fact as with many warm weather destinations, Orlando is busy during the summer months, with children out of school. Its also a fact that the off season’s, spring and fall will grant you the best deal on room prices, as well as lines at the attractions. However, beware the time that “Spring Break Escapees” are in town. You may ask yourself about winters, but many people especially those in cold climates, choose winter for an escape to warmer weather. Magic Savings Tip: As with most family vacation destinations, search for discounts and passes online and at your hotel. They can really add up to quality savings especially on large families. Also, by using public transportation, you can save by not renting a car or van. But Orlando isn't only a gateway to the theme parks. Families, friends and couples can enjoy art, culture, nature, shopping and golf in this animated and lively city. Spend days in the worlds of Walt Disney, enjoying rides, seeing characters (bring your camera to get a photo of you and Minney Mouse). Adults, there are a couple of really nice outside bar/restaurants for you to enjoy an adult beverage. One in particular overlooks the Disney Ferris Wheel and specializes in martinis. Universal Studios is also a “must see” adventure for the whole family. Another fantastic surprise for the youngsters in your family would be a visit to the Orlando LEGOLAND. When visiting Walt Disney World, why not plan dinner one night at The Pirates Dinner Adventure, where you not only get great eats, but also get to act in a live performance. You can visit Universal City Walk, for some interesting shopping, lunch or dinner at the themed restaurants, or just a relaxing glass of wine in one of the nightclubs. If you have planned right, and saved some money with hotel room and coupons, maybe its time for one “fine dining” experience. If so, there’s one restaurant that is quite possibly the finest in Orlando, Victoria and Albert’s. This restaurant has received for the past 12 years, the Five Diamond Award for excellence. Located within the Walt Disney World’s Grand Floridian Resort and Spa, you’ll be blown away by the 6-course dinner. Located fairly close to Orlando, the Kennedy Space Center is a fun and educational experience for the whole family. Take a drive to Daytona Beach, site of the Daytona 500, where you can actually drive your rental car on the beach. You’re in Florida, so why not get the ultimate Florida experience, Gatorland. Located just north of Kissimmee. Gatorland was here long before Disney, and is still a star attraction today. Walk through the giant open jawed entrance, into this 110-acre theme park where you could be dinner. You can easily spend a half-day at this park, where youngsters can wrestle a live alligator, and the whole family can zip line over a pit of large adult alligators. Staying in the city's center gives you easy access to resorts like the Universal Orlando Resort, where J.K Rowling fans can explore the Wizarding World of Harry Potter. 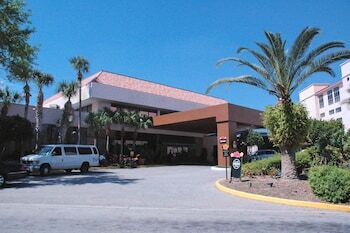 The Renaissance Sea World and the Embassy Suites Orlando are the perfect hotel choices. If you're in town to visit LEGOLAND, book a room at the eco-friendly Peabody Orlando Hotel. 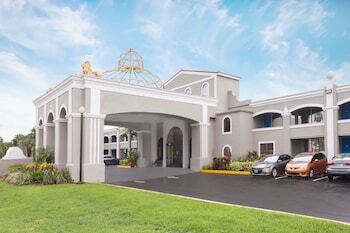 It offers guests a superior and stylish stay and an easy commute to the theme park and main city attractions. At the other end of the spectrum, Orlando is a thriving business city. 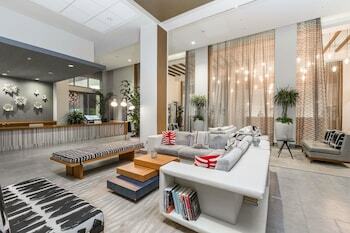 Corporate travelers will appreciate the style, class and convenience of the Rosen Shingle Creek Hotel. 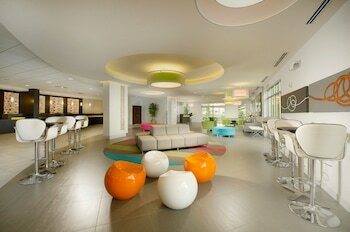 The Caribe Orlando Hotel offers a similar service and both have an abundance of meeting and corporate facilities. Sport fanatics on their way to watch the Orlando Magic basketball team should book into the Rosen Center Hotel or the Rozen Plaza. These hotels put you within close proximity of the Amway Center and offer easy access to pre-game festivities and dining. If you have but limited time in Orlando you need to focus your planning on achieving max bang for your buck. Start at the Epcot Center and head straight into Future World where you should jump on the Mission: Space, Soarin' and Test Track rides straightaway. Do yourself a time-conscious favor and organize a FastPass before you arrive so you can go straight to the head of the queue. They are the business when you're limited by time and it's worth the extra effort. Now that the heart is beating suitably fast, head to the Innoventions area and drool over current and future hi-tech appliances. Stop for lunch at the Sunshine Season Food Fair, a collection of quick-service eateries that will satisfy most any appetite, then visit "Honey, I Shrunk the Audience". For Day 2 we suggest heading to Universal Studios and...turn left instead of the usual right. Begin at Shrek 4-D and Jimmy Neutron's Nicktoon Blast. While in this part of the Park go to the Terminator 2: 3-D show, then have lunch at Richter's Burger Co. or International Food and Film Festival. The best bet of all in a situation where you're pressed for time in the theme parks is to invest in a FastPass (or brand equivalent). They ensure you go to the head of the queue and instead of waiting 45 minutes for a ride that only takes 3 mins... you get to do as many rides as you can possibly fit in to your hectic day. We'll help you find a huge discounts on great Orlando hotels so you can spend more money at the Theme Parks of your choice. Packing the kids up and heading to Orlando is one of the great and memorable vacations that every family needs to do. The climate and the kid-friendly environ makes it a wonderful place to bring the family. You'll find decent accommodation at very good prices with us. Everyone's favorite first destination are the theme parks - and there are plenty to choose from. Your choices include Magic Kingdom Park at Walt Disney World Resort to The Wizarding World of Harry Potter at Universal Orlando Resort, there's a world for everyone to escape into! Experience a wonderland of ocean animals at SeaWorld. Discover fun for the whole family at LEGOLAND Florida, one of the area's newest theme parks. Legoland is a great addition to the theme park world. Ideally suited to kids aged up to about ten, Legoland has a series of themes to take the kids through. There's DUPLO Village for the little ones and LEGO Kingdoms which takes the kids back to mediaeval times. The Land of Adventure is full of hidden tombs and buried treasure and in LEGO city, the kids can explore what it's like to live in a scaled down city. The Imagination Zone is all about exploring and creativity - ideal if you want to expand the horizons of your child's learning capacity. While in LEGO Technic there are adventure rides, the Aquazone wave racers and more - all designed to keep adventurous kids entertained. Epcot is well worth a visit - even if you've been before. They invariably have a festival or big theme event happening and you can enjoy the imagination, the shows and the interactive experiences along the way. It's a full day's experience and you need to leave enough time for queuing for some of the more popular attractions. Our advice is to start early and beat the crowds to the attractions and the food concessions. Who doesn't love a secret! Something you know and not everyone else? Huh! Head to Orlando and, boy, have we got a secret for you. But first, go to Cheaprooms.com and find a great value Orlando hotel room close to the Parks. The best part about Orlando is how close you are to all the theme parks. Courtesy buses will get you where you need to go, so staying here is easy. 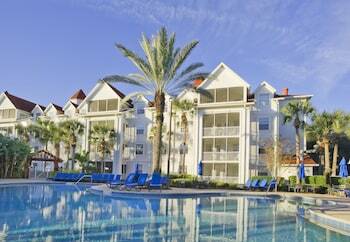 Find cheap accommodation in Orlando and enjoy a great family vacation in style. Did you know? Disney World is actually an iceberg. In the sense that it's built on top of a vast underground city of services, storage and tunnels to facilitate the movement of acts and staff between venues. If you find yourself at Cinderella's Castle, you're technically on the third story of the complex. What you smell isn't always real. That delicious waft of freshly cooked food on main Street? That water and leather smell in Pirates of The Caribbean? It's all courtesy of the Disney Air Smellitizer, located underground and feeding the park by a series of vents. Hidden Mickeys are everywhere. Created by the Imagineers, they're hidden in plain sight. All you have to do is focus on your surroundings. You'll also find hidden Minnie, Pluto and Goofy too. Look for full figure silhouettes. If you're a first time visitor to Orlando, it's likely that you have no idea where to eat - where the good the bad and the indifferent are. Time is too precious to waste on bad food so here are a few suggestions. But first, go to Cheaprooms.com and find a great value Orlando hotel room close to the theme parks. The best part about Orlando is how easy it is to get to the theme parks and everything else Orlando has to offer. Find cheap accommodation in Orlando and look for packages that include breakfast. Poor old Orlando! Long renowned as the center for all things theme park, it has suffered in the food reputation stakes. But you can get decent food here, never fear. Is there a large choice? In Disney World, you'll be eating in the parks (the Magic Kingdom, Epcot, Hollywood Studios, or the Animal Kingdom) and your choices are surprisingly good. From the ubiquitous (and massive) turkey legs at mobile food carts to the Five Diamond AAA den of luxury Victoria & Albert's. Can I get vegetarian food here? Every restaurant, including all but the smallest quick-service counters, has at least one vegetarian item. Can I find healthy food there? Disney restaurants feature a Mickey Check meal, which aligns with the U.S. Dietary Guidelines for Americans. For example, you might find baked Florida fish sticks with whole-grain rice pilaf, seasonal vegetables, and, for dessert, a fruit kebab. Taking young kids to Orlando is relatively straightforward - you know what they're going to enjoy and how best to structure the days around their needs. Teenagers, on the other hand, can be an exercise in endurance - so here are our tips on making the visit a pleasure for you, them and everybody. Go to Cheaprooms.com and find an excellent value Orlando hotel room with a family package deal that includes breakfast if you can. You want to be as close as possible to the park area as your budget will allow. This will save you time in the mornings and a quick trip back at night will be a joy. 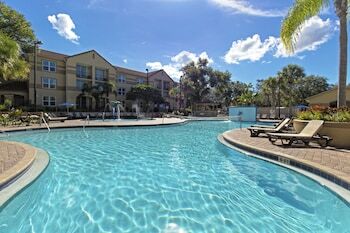 Find cheap accommodation in Orlando now and spend money on your vacation not your accommodation. Our first tip is on how to keep the costs down. To do this, you might want to consider the Orlando Visitors Pass. It seems pricey at first - at the time of writing $260 - but it gets you both Universal Parks, Seaworld, Seaworld's Water Park, and Wet & Wild. That works out at around $52 a park, so compare that to what you'd pay individually across the number of days you're there. The best water parks are undoubtedly the Disney ones - and teenagers can occupy themselves here all day long in safety and security. On a hot Florida day there's nothing better and you'll be quite comfortable in a shady spot with a good book - unless you're an action fan too! A one-day pass at Disney World is $79. Now, here's where you need to know how hardy you and your kids are - If you've got the stamina, a one-day park hopper for $131 enables you to do two parks in one day and save a bit of money overall. It may also keep the kids active all day - which is a bonus. If you opt for that, your best bet is to start at Hollywood Studio as soon as they open. Knock off Toy Story first, then Rock and Roller Coaster, and Tower of Terror. The key here is to get to the park at first light (not really, 8am will do you!) After doing those highlight rides, take the Disney bus to Animal Kingdom. Ride Everest, Kali Rapids, and if time permits, the Safari. If you stayed at Animal Kingdom through the early afternoon you could be at the Magic Kingdom by mid-afternoon. Here's where you're testing everyone's stamina because that's a big day on the run. We all know the pressure! So much to see and do, but so little time. If you're heading to Orlando with the family, here are our top 3 'must sees'. But first, check cheaprooms.com to find a central hotel in Orlando and give yourself the opportunity to explore the very best rides and things to do in Orlando. There are more than 450 hotels to choose from. Find Orlando rooms on the main resort strip. There are plenty of bargains to be had, but be quick for the better properties. Everyone seems to agree - The Incredible Hulk Coaster at Universal - is the ride of the moment. It is awesome, but be prepared to queue. Our tip is to get there early and reduce the wait time dramatically. The new Harry Potter area is also getting rave reviews, as does crowd favorite the Rip, Ride and Rollercoaster. SeaWorld Orlando has always been a premier attraction. Ride the Kraken, and then spend as much time as possible on the animal exhibits. Don't miss the Killer Whale show and the kids will love the Petting Stingrays. The Ride to Antarctica is also excellent entertainment. If you had to miss something, don't bother with the shark tunnel - it's a little tired. Our other tip is to take as much of your own snack food and beverages as you can - the prices are high. Sometimes, you can just have too many queues to deal with, too many people and too many 'same, same' exhibits. Take time out at SeaWorld's Aquatica Waterpark. On a hot summer's day in Florida there is nothing better than letting the kids (and yourselves) loose in a waterpark that's safe, has plenty of thrills and spills and is big enough to cater for the crowds. Aquatica is a relief! Doing Orlando on a Budget! There's nothing more dispiriting than having your big vacation break - especially with young kids - and going way over budget and needing to curtail activities. Likely this is a 'once in a lifetime' vacation for many people so here are some safe and simple ways to save a couple of bucks. First, browse Cheaprooms.com for quality, budget hotels in Orlando. 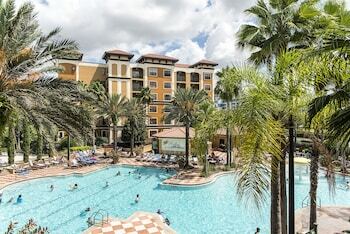 There are more than 480 Orlando hotels to choose from and most represent excellent value for money. Look out for rooms that offer a small kitchen if possible - this simple expediency will save a fortune in purchased meals. Make sure you get a good deal on Cheap Rooms and spend your cash on what's really important - a fabulous vacation for the kids! Your first answer in saving big money is the Orlando/Orange County Convention and Visitor's Bureau Magicard. This offers some $500 worth of discounts on car rental, attractions and meals (and more). You need to apply for it before you travel and it can take up to four weeks to arrive so plan ahead folks! Look for accommodation that offers things like a continental breakfast in with the price. Some hotels also offer free hors d'oeuvres at a set time each evening (to encourage consumption at the bar). Ask at the front desk for all their discount coupons and booklets and plan your next days' activities on the basis of the deals you can find. Pack snacks and drinks for your visits to the theme parks rather than relying on concession stands for water and nibbles. The costs in-park are prohibitive and water is water is water (so bring your own!). Eat a big breakfast in your room or at the hotel buffet and then a light lunch in the Park, leaving your big meal for the end of the day on the basis of a coupon. Many restaurants also offer early-bird deals for the evening meal. So you thought Orland was just for kids? Not true! There are a ton of things for the adult (with a bit of the child left in them) to do in Orlando. Of course the thrill rides are hard to beat - and you really should do them all - but sometimes a nice restaurant, a sophisticated resort, even a local flea market is a welcome relief. First thing to do is browse cheaprooms.com to find a decent place to stay in Orlando and enjoy all that Florida sunshine. A hint - for a sophisticated resort experience you might try the Grande Lakes Orlando resort - it boasts a Greg Norman golf course plus a huge spa. 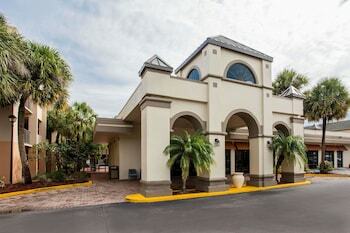 You'll find it - and more discount hotel rooms in Orlando on our website. But you'll need to be quick - good properties book out fast. The history of Florida, and Orlando in particular, can be seen at the Orange County Regional History Center on East Central Boulevard. The former Orange County Courthouse is itself a historic building but the real action is in the exhibition that takes you through the area's growth from a swampy, humid country sparsely populated with hardy souls through the arrival and prosperity of citrus growers and pioneering cattle ranchers to the theme park visionaries of the mid twentieth century to the glamorous town for all seasons that is Orlando today. If you're still enjoying the idea of exploring Florida history, take a walk through the brick-lined Thornton Park residential area downtown. An older area, It's now an artist hangout with the requisite excellent coffee shops, charming boutiques and quirky galleries. While you're in downtown Orlando, visit the Little Saigon area in the commercial area of Orlando - not for the scenery (which is dull), but the food - exquisite Vietnamese dishes with fresh seafood the specialty. Any number of restaurants are there for the choosing and you'll slip out the door having feasted for between $20 - $40 for two of you. Orlando is a must-do at some stage while the children are young. After all, this magical place was designed and built for them - and the kid inside us all. Go to Cheaprooms.com and get yourself to Orlando with a cheap hotel package to suit your budget and family needs. There's endless entertainment here and activities every day and night of the week. 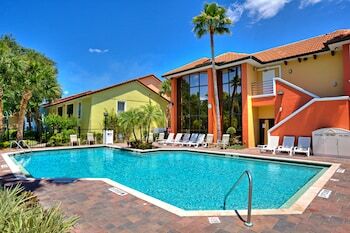 Find cheap accommodation in Orlando now and let the excitement begin! Start your Orlando excitement in Universal Studios and give the kids an inside look at how movies are made and the back story behind some of their favorite movies. Universal is home to Shrek and Donkey in 'Shrek 4-D', as well those lovable aliens in Men in Black and the Jimmy Neutron Nicktoon Blast. For good, family-style eating in the Orlando area your best bet is probably Market Street Cafe at Lake Buena Vista. They do diner fare that the children will enjoy, plus meatloaf and noodles - all family favorites, whatever the age group. On Day 2 head to Gatorland on South Orange Blossom. Not the usual entertainments you would have thought, but something the young kids will love. You get to see alligators up close and you can even pet one or two. There are educational shows and a great photo op at the end. Cypress Gardens Adventure Park is a hidden gem amongst all the 'noise' of the other theme parks. They really are gardens - with breath-taking tropical flowers, butterflies galore and beautiful topiary. 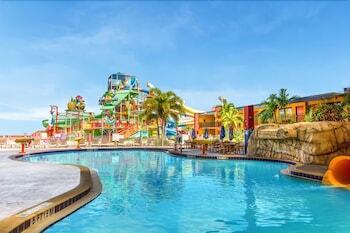 Best of all, there's a water park here to take the heat out of a Florida day. Day 3 - the must see is SeaWorld on SeaWorld Drive. There sea lions waiting to entertain you, gigantic killer whales flinging themselves high into the air and dolphins, penguins, stingrays, manatees and much more.